Online, it can be very difficult to research the number one spot on Google search results for certain keywords. It’s a constant SEO fight to get top. This ultimately means you need to perform intensive SEO on your article to gain it maximum exposure. 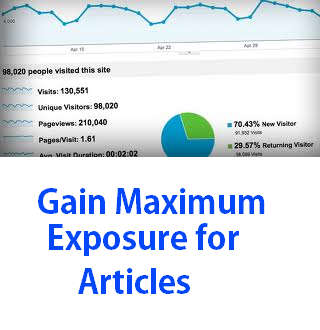 However, there are other ways you can gain exposure of an article, free, organic and easy. If you just write an article, the only organic will come from search engines. If you include an image in your article, you include all the Google, Bing, Yahoo etc.. image searches which can have the potential to help bring in double the traffic. Therefore, whenever you make an article, always make sure you have an image in there too. Google searches every page on the internet. After that, it searches all the links on every article. In theory, if you place enough links in all your articles, you can cause Google to go around in circles because you have made a spider-web of links linking to each other. This helps massively in boosting your pagerank meaning your closer to the top position of page one on Google search results. I have found that Twitter and Reddit are the two top ways to get fast short term traffic. They provide instant results because if you reach the right people in each social media site, you will get traffic. Doing this to the same article every two-three days can prove quite effective in bringing 1000s of views of traffic in the article’s first week of publication. I hope that has made clear how with a few simple steps you can gain lots of traffic for the short and long term. When you create an article, you will want to give it the best potential to get the maximum amount of traffic. Implementing the above will do just that. i think stumbleupon is also great way to get some real traffic. but there is no definite rule for what type of post they like on stumbleupon. though you can generate more traffic by adding beautiful pics instead of pics because with advent rise of image bookmarking sites, sites having beautiful pics are getting more traffic. I completely agree with you! New social media sites like StumbleUpon make it really easy to gain good quality traffic.